“Green Book” is a road movie set in 1962, long before Apple or Google Maps or Waze, but as it makes its way from New York to Alabama and back, you might nonetheless imagine a little GPS voice in your ear telling you what’s up ahead. There is virtually no milestone in this tale of interracial male friendship that you won’t see coming from a long way off, including scenes that seem too corny or misguided for any movie in its right mind to contemplate. “Siri, please tell me they’re not going there.” Oh, but they are. “There” includes an entire subplot devoted to fried chicken, which the African-American member of the buddy duo has never eaten. He eventually (spoiler alert) acquires a taste, thanks in part to the urgings of his white counterpart. The crispy poultry motif figures heavily in the “Green Book” trailers, conceivably as a warning. Every suspicion you might entertain — that this will be a sentimental tale of prejudices overcome and common humanity affirmed; that its politics will be as gently middle-of-the-road as its humor; that it will invite a measure of self-congratulation about how far we, as a nation, have come — will be confirmed. 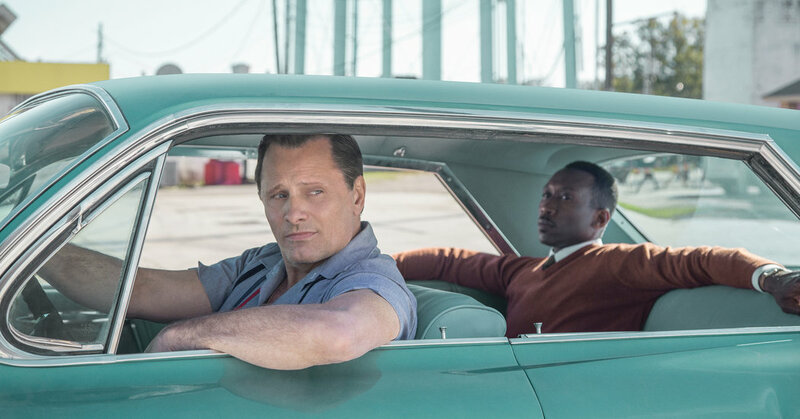 Because the white guy, an erstwhile nightclub bouncer named Frank Anthony Vallelonga and known as Tony Lip (Viggo Mortensen), is behind the wheel of a car while the black guy, the pianist and composer Don Shirley (Mahershala Ali), rides in back, “Green Book” seems to invite comparison to “Driving Miss Daisy.” But its pedigree is slightly different, reaching back through the Gene Wilder-Richard Pryor comedies of the 1970s to “The Defiant Ones” in 1958, which starred Sidney Poitier and Tony Curtis as runaway convicts in the Jim Crow South. If you want to get scholarly about it, you could stretch the tradition even further, following literary critics like Leslie Fiedler and D.H. Lawrence and seeing Tony and Don as manifestations of a primal American archetype. Huck and Jim. Ishmael and Queequeg. Natty and Chingachgook — bonded cross-cultural pairs that symbolically redeem America of its original racial sin. “Green Book,” written and directed by Peter Farrelly (of the once notoriously naughty Farrelly Brothers), is based on a true story. Tony Lip and Don Shirley were real people, and the movie grounds their journey to the South in piquant historical details. The book referenced in the title was a guide used by black motorists to help them avoid the dangers and indignities of road travel, especially below the Mason-Dixon line. Don’s record company, having booked him on a tour through several southern states, hires Tony to serve as a de facto bodyguard as well as a chauffeur. He also becomes, inevitably, a kind of white savior, intervening to shield his employer, when he can, from white people who have no such obligation. The hypocrisies of segregation are laid out — Don is celebrated as an artist and denied service at hotels and restaurants — as are the brutal and insidious manifestations of white supremacy. The real drama, and also the comedy, is between the two men. The contrast of their temperaments is not subtle. Don, highly accomplished and educated — he’s “Dr. Shirley” to most, “Doc” to Tony — is formal and fastidious, an aesthete and an intellectual with no patience for vulgarity or sloppiness. He’s also gay, though this fact is handled with a discretion that borders on squeamishness. Tony is a caricature of Italian-American family-man exuberance. He’s voluble and emotional and constantly smoking, eating, or both at the same time. At one point, reclining in a hotel-room bed, he folds a pizza in half and shoves it in his mouth. Not a slice of pizza. The whole pie. His warm, earthy authenticity has a salutary effect on Don, whose hauteur masks a deep loneliness. In return, Don refines Tony’s taste and dissolves his prejudices. As I said, there’s not much here you haven’t seen before, and very little that can’t be described as crude, obvious and borderline offensive, even as it tries to be uplifting and affirmative. And yet! There is also something about this movie that prevented me from collapsing into a permanent cringe as I watched it. Or rather, two things: the lead performances. (Linda Cardellini, as Tony’s wife, Dolores, is wonderful too, but she’s only around at the beginning and the end.) Mortensen, plump as a mortadella, doesn’t so much transcend the ethnic clichés of the role as chew through them, emerging into a zone of vaudevillian poetry. Ali, more or less the straight man in the double act, approaches every moment with a razor-fine wit, a lively awareness of the absurdity of the situation that may not belong to the character alone. These men are good company, even if the trip itself might cause some queasiness.